While visiting family in the Metro Detroit area this weekend, we spent an afternoon at the Rochester Cider Mill. It wasn’t even our idea to suggest it! We were simply along for the ride, but we never turn down a trip for cider and donuts. 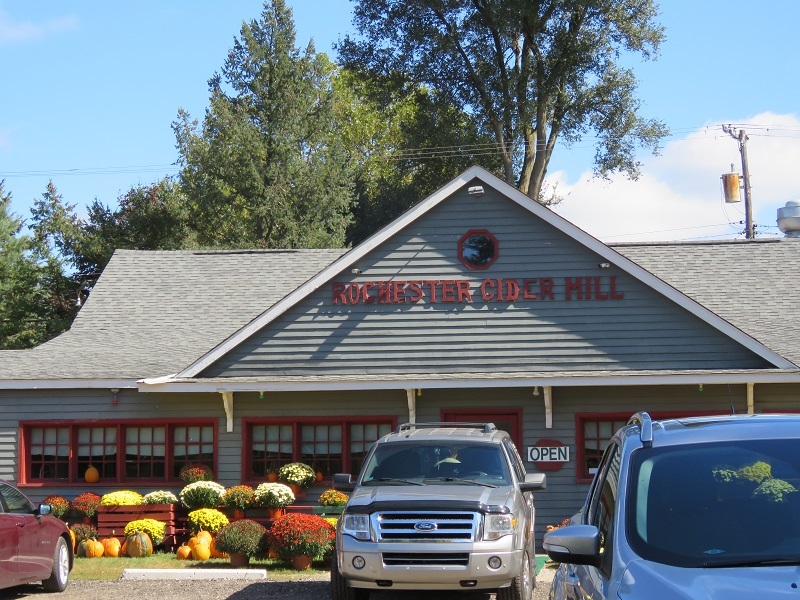 The cider mill is a popular activity in the fall in Metro Detroit, and there are a number of different options to choose from. Because we had a bee allergy in the group, we decided to look for a smaller one that would hopefully have less people (and bees). We were pleased with the Rochester Cider Mill. The inside of the store tempted us with all sorts of delicious delights – fresh apples, pie pumpkins, popping corn, honey, apple butter, and other locally made goods. They also had, of course, pies, cider donuts and apple cider made fresh and on site. The smell alone was heavenly! The outside had a wide selection of pumpkins, mums, corn stalks and hay bales for decoration. We were definitely drawn to the impressively large pumpkins for sale for only $14! While my mom browsed the selection for some items she’d been craving, we snapped some pictures and watched our nephew explore the pint-sized entertainment. There is plenty for a young toddler to do. He enjoyed the hay bale slide, seeing all the pumpkins, and playing with the dried corn table, which featured pounds of dried corn and a variety of barn toys such as tractors and trucks, and seemed to be a popular draw for the preschoolers and toddlers. He also enjoyed a brief visit up to the petting zoo area, where goats, sheep and chickens can be fed with feed sold inside the store. There is also an old truck available for the children (and those young at heart) to clamber on, and some tires to climb through. We settled down at the on-site picnic area to enjoy the fresh cinnamon-and-sugar cider donuts and cider. It was a beautiful late September day: warm in the sun, cool in the shade. After finishing up and taking a few family pictures around, we headed out with our bounty (leftover cider and donuts, a massive mum, one very large pumpkin, two pie pumpkins and a couple other items). If you are going, don’t forget to bring cash as they only take cash or check. They do have an ATM on site for those who forget to bring cash. The one part of the experience that we missed was that they don’t have a giant, old wooden press to watch the cider being made while you wait. It was a memorable day with family, one that we will enjoy remembering for some time to come. We hope that you will be able to make your own memories at one of the pumpkin patches, apple orchards, corn mazes or cider mills that we list here at Funtober this year. This entry was posted in Funtober. Bookmark the permalink.